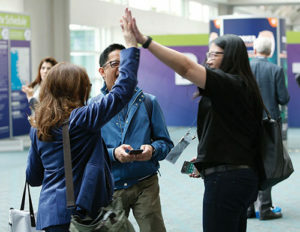 There are many formal and informal ways to expand your network at the ATS 2019 International Conference. Consider adding these events to your itinerary. ATS 2019 attendees are invited to attend any of the 14 ATS Assembly Annual Membership Meetings on May 19 and 20. Section Meetings will be held on May 19 and 21. Please check your conference program for details. These meetings will be held in Hyatt Regency Dallas, where assembly leaders will provide updates on the assembly’s activities, and members will give input, get involved, and network during the meetings. Voting results for future assemblies also are announced during this time. Take the opportunity to support women and diversity during two separate luncheon forums. The Diversity Forum takes place on Sunday and the Women’s Forum will be on Monday. Both forums, which take place in the Hyatt Regency, Landmark D Ballroom, are free and include a plated lunch. Pre-registration is required, but there are usually seats available at the door on a first-come, first-served basis. All clinicians are invited to meet, network, relax, refresh, and learn in the Clinicians Center and Learning Lab, located in Hall B (Level 2) of Kay Bailey Hutchison Convention Center Dallas. The Center is open Sunday through Wednesday. Every morning, coffee and a light breakfast will be available from 7 to 9 a.m. Educational programs kick off on Sunday. On Monday, May 20, don’t miss the ATS Outstanding Clinician Award Reception. If you are a graduate or medical student, medical resident, clinical or postdoctoral fellow, or junior faculty member, these networking opportunities are for you. The Networking Exchange is an annual event that follows the Opening Ceremony, 5:30-6:30 p.m. Saturday, May 18, at the Omni Dallas Downtown. Meet and mingle with peers and prominent thought leaders. Cocktails and appetizers will be provided. Located in Hall B (Level 2) of Kay Bailey Hutchison Convention Center Dallas, the Center for Career Development will offer a complimentary breakfast each day at 7 a.m. and a Professional Networking Hour from 4 to 5 p.m. with free cocktails and appetizers. Each day during the conference, the CCD features informal workshops aimed at enhancing the professional development of early career professionals. You can learn more about CCD scheduled activities at conference.thoracic.org/program/early-career-professionals/ccd.php. All international attendees are invited to stop by the International Participants Center, open Sunday through Wednesday in Hall B (Level 2) of Kay Bailey Hutchison Convention Center Dallas. Use the Center to connect with colleagues, network, or just relax while enjoying complimentary snacks, coffee, and soda. Don’t miss the reception to recognize international attendees and honor this year’s International Trainee/MECOR award recipients on Tuesday, May 21, at the Center. Scientists and researchers looking to network, learn, and relax should plan some time in the Science and Innovation Center, open Sunday through Wednesday in Hall B of Kay Bailey Hutchison Convention Center Dallas. A complimentary breakfast will be served in the SIC at 7 a.m. during the conference. Light refreshments will be served each day at noon. If you need to catch up on basics before attending a symposium, you can attend an SIC 101 series presentation. Look for a complete list of these online in the Resource Center at conference.thoracic.org/attendees/resource-centers. The ATS Foundation Research Program Benefit supports and celebrates the Research Program in launching the careers of young investigators dedicated to scientific discovery and better patient care. This year, the Foundation will honor Sharon Rounds, MD, with the Breathing for Life Award at 7 p.m. Saturday, May 18, at Union Station in Dallas. Tickets are available online. Choose individual tickets or a reserved group package. List current as of April 8, 2019.